The West Georgia Technical College Board of Directors and the WGTC Foundation Board of Trustees brought home the big hardware at the Technical College System of Georgia’s 2018 Leadership Conference last month. Due to the work of both boards, West Georgia Tech was awarded the second annual Leadership and Excellence in Attendance and Dedication (LEAD) Award for board commitment and enthusiastic participation in the conference. For the first time ever, the WGTC Foundation Board of Trustees was recognized as a 2018 Technical College Foundation Association of Georgia Role Model Foundation Board. To achieve this certification, a Foundation Board of Trustees must submit documentation to the TCFA documenting its active engagement in the Foundation’s work. 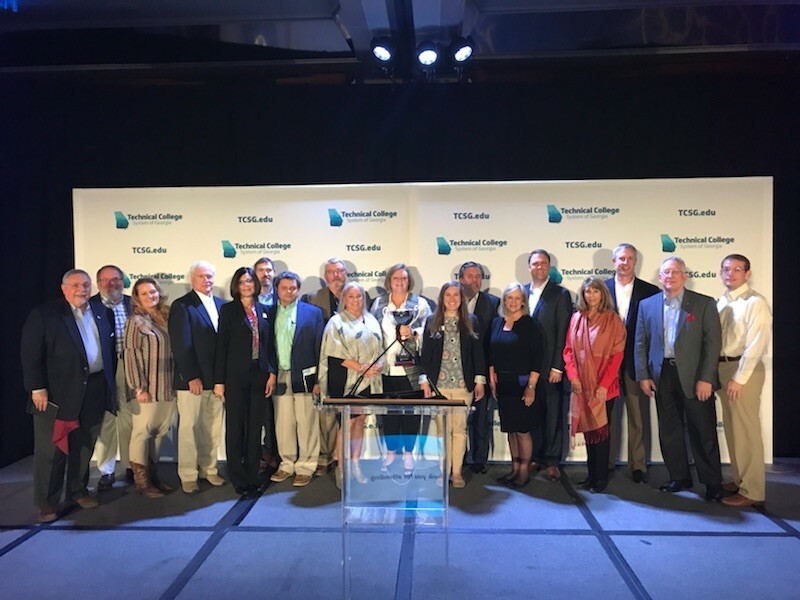 The WGTC Foundation was one of 11 foundation boards across the state recognized by TCFA and TCSG Commissioner Matt Arthur October 30, 2018. Members of the WGTC Foundation Board of Trustees are President Bryant Hightower, Vice President Greg Wright, Treasurer Ned Fowler, Mark Foster, Daniel Jackson, Linda McWhorter, Jim Mottola, Rocky Clay, Dr. Bob Patterson, Latesa Bailey, Helen Rice, Murray Bradley, and Delores Goldin. West Georgia Technical College was honored with the LEAD Award for board commitment and participation at the Technical College System of Georgia’s Fall Leadership Conference last month in Savannah. Members of both the WGTC Board of Directors and the WGTC Foundation Board of Trustees were on hand to receive the award. The WGTC Board of Directors was recognized for 100 percent board certification for the fourth year in a row. This designation means that all board members are certified by completing needed training and education through the Technical College Director’s Association. Members of the WGTC Board of Directors are Chairman Bill Stone, Chair-elect Michael McNeely, Tommy Britt, Aaron Mabon, Joel Rogers, Denise Taylor and Bill Hightower. Also at the Leadership Conference, the J. Randy Jackson Family was selected as a TCFA Benefactor of the Year for 2018. The WGTC Foundation nominated the Jackson Family in recognition of their continued commitment to technical education and workforce development. The Jackson family established an endowed scholarship in memory of the leader of Kia Motors Manufacturing Georgia. Mr. Jackson’s wife, Deborah, and son, Jamey, accepted the award from Commissioner Matt Arthur on behalf of the family.